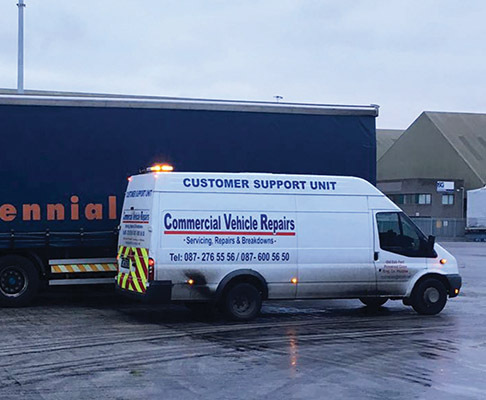 Covering North Wicklow and South Dublin, Commercial Vehicle Repairs provide operators with unrivalled fleet maintenance and repairs services. As the long-established, thoroughly-professional operation moves into its 21st year, we travelled to Bray and met founder / proprietor Gerry Sheeran to find out more about this exceptional family business. Synonymous with high-quality workmanship and outstanding levels of customer service, Commercial Vehicle Repairs provides a full range of mechanical, and electrical solutions to HGVs, LCVs, vans and 4x4s, including servicing, fleet maintenance, 24-hour breakdowns, diagnostics and on-site repairs and checks. Originally founded in East Wall, Dublin in 1996, the business relocated to Bray or strategic reasons in January, 2012 and has continued to go from strength to strength, offering professional, dependable and affordable services to an expanding base of owner drivers and fleet operators. Having established a reputation for excellence, Commercial Vehicle Repairs benefit from a large volume of repeat business and regularly attract new customers on the strength of positive word of mouth. Boasting four-and-a-half decades of experience working on commercial vehicles, founder Gerry Sheeran brings a wealth of expertise to the winning Commercial Vehicle Repairs equation. Down through the years, CVR have forged a strong and lasting association with the waste industry. They maintained all of Greenstar’s trucks in North Wicklow before the company was acquired by Panda Waste (who have their own maintenance division) and currently have a contract with Arklow Waste. “We do all the checks and keep vehicles on the road for Teach Solais, who do film and TV lighting, and Team FX, who do special effects for televisions and films,” Gerry confirms. For any business to hold its own in a sector as competitive as commercial vehicle repairs and servicing is an accomplishment in itself. However, Commercial Vehicle Repairs have not only survived but are currently experiencing a massive surge in demand for their tried and trusted services. To what does the founder attribute the longevity and enduring popularity of the business? All work is carried out to the very highest prevailing industry standards and Commercial Vehicle Repairs’ compliance and commitment to Health & Safety is recognised by customers and third parties alike. It’s a close-knit family operation, with Gerry and his sons Ian and Peter on hand to guarantee a knowledgeable and personal touch. “We also have two apprentices here at the moment and we’re on call 24/7, although most of the work is carried out in the workshop between 9am and 6pm,” the founder confirms. With so much demand for Commercial Vehicle Repairs’ services, does Gerry feel there’s scope for expansion? Commercial Vehicle Services have two fully-kitted mobile service units on the road –both Ford Transits –and Gerry points out that his strong network of contacts means that he can offer customers a complete one-stop solution, including fuel injectors or any other part or service that a truck or van might require. Looking to the future, he is confident that the business –which has also handled a lot of breakdown work for major manufacturers like Iveco and MAN in North Wicklow - will be around for another 21 years.